There are many elements of our lives that we may feel totally powerless over but our thoughts are not one of them. We absolutely have the power to choose what we will dwell, meditate or think continuously about. Now, do not get me wrong. I am not saying random thoughts, we did not choose, will not ever enter our minds…of course they will. However, to give them space to take up home, is totally up to us. When thoughts based on the undesirable circumstances of our lives are bombarding our minds like a military assault. We have the responsibility to end it. Is it easy? Of course not! Is it possible to put a stop to it? Absolutely! God gives us the power to take control of our thoughts and when we follow His path, we will find the onslaughts get fewer and further between. Regardless of what is going on and from whatever direction it may be coming; do not fill your mind and heart with thoughts of hurt, pain, frustrations and the people who makes you “feel some kind of way.” Instead, choose to take your power back by thinking and meditating on POSITIVE THINGS! Everyday, many times a day, we have the choice to think good thoughts or not…the choice is ours. 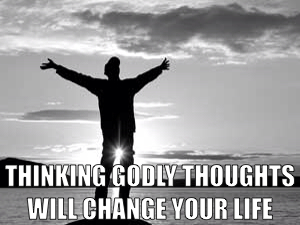 Make the right choice, the Godly choice and choose to think the thoughts that will bring life and not death. Very True Sebastien, rubbish in , rubbish out, what we focus on affects our thinking and the Scripture you shared gives us the right focus and we see too in the Scripture below that we are to make every thought captive to Christ in our seeking to obey Him because of our Love for Him..
Hello Anne, it sure has been a while! More now than ever, we need to drown out the noise that come to distract us from our focus. The thoughts we have will tell us greatly whether or not we are focusing on the things of God. As you pointed out with the verse you shared, we have to take an active role in clearing said “noise” from our minds. Thanks Anne…Blessings! !